In a food processor, add figs, dates, water and 2 tablespoons granulated sugar - process until almost smooth. In a medium bowl, whisk together flour, ground anise seeds, baking powder, baking soda and salt. In a large mixing bowl, beat together butter, cream cheese and remaining 1/2 cup granulated sugar until light and fluffy. Mix in vanilla and yolk until combined well. Pour in the flour mixture and mix just until combined. Evenly divide dough in half and form each into a rectangle. Wrap in plastic wrap and place in the refrigerator until firm, at least 1 hour. Remove one piece of dough from the refrigerator and roll it out between 2 sheets of parchment paper into a 9" by 7" rectangle. Take off one piece of parchment paper and gently spread one half of the fig/date mixture evenly on top of the dough, leaving a 1/4" border around edges. Starting with a long side of the dough, roll up into a log. Scatter 2 tablespoons of the turbinado sugar on your work surface and roll log back and forth through it to coat the outside completely. Repeat process with remaining dough, fig/date mixture and turbinado sugar. Wrap each log in plastic wrap and chill until firm, at least 4 hours. Using a sharp knife, carefully cut logs crosswise into 1/3" thick slices - place about 2" apart on parchment lined baking sheets. Bake until the cookies pale golden and lightly browned on the bottom - about 15 to 17 minutes. Remove from the oven and let the cookies sit for 1 minute and then move them to a wire rack to cool completely. 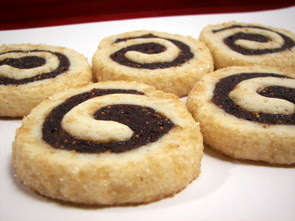 I love things with dates, these look good and I like the addition of the anise, your swirls are so perfect! Laurie - Thanks! We really liked the addition of anise. We own a restaurant on Nantucket and have made these cookies for holiday parties. They are the best! Savory and not too sweet, and beautiful looking as well! Anon - Glad you liked the cookies! I must make them again soon! Thanks for the recipe. An excellent addition to my holiday baking! Jennywenny - Awesome! Thanks for the feedback!